Two lanes of cars waiting to turn left on Highway 20 from Spring Hill. 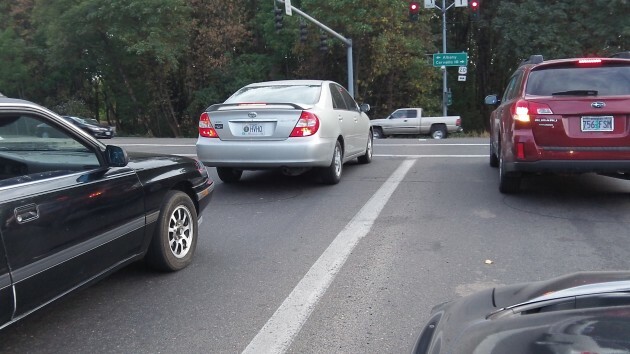 The latest from the local transportation beat, where I seem to be stuck lately: North Albany drivers like the dual left-turn lanes from Spring Hill Drive on to Highway 20, but ODOT does not, and so the lanes will probably have to go. That’s the gist of a memo that has gone to the Albany City Council ahead of its work session Monday. The dual lanes were laid out as a temporary measure to relieve congestion when traffic was detoured during the reconstruction of North Albany Road. But according to the memo, ODOT worries about trucks tipping over on the steeply banked turn and crushing vehicles making the left turn to the right of them. Before ODOT would allow the change to be permanent, it would insist on studies of its benefits, an analysis of crashes at the intersection, a plan to enforce a (so far tempoary) detour for trucks, and a commitment by the city to pay for modifying the Spring Hill/Highway 20 signal. The city staff is guessing that the studies would cost about $20,000 and the signal modifications another $80,000 or more. A request to keep the dual turn lanes would have to come from Benton County, as Spring Hill is a county road, but Albany would have to come up with the money. It’s not clear why the signal would have to be upgraded since it has worked just fine in conjunction with the dual lanes all summer. But before that, trucks HAVE overturned on that corner, and having them tip over on a car to their right sounds like a legitimate concern. Trucks were detoured over to North Albany Road during the construction project, but the city staff says compliance with the detour is lagging now that the project is over and enforcement has backed off. Why not designate the right lane as the truck lane to make the turn? “All trucks keep to right”. I’m sure this condition is elsewhere around the northwest. Seems to me that ODOT designed and constructed an unsafe intersection years ago and now to improve traffic management they want local governments to pay the price for correcting their error. I support the dual left movement but oppose the move by ODOT to make Albany and/or Benton County pay the price for fix a problem they created with a bad design years ago. If all trucks followed the “Turn from Right Lane” it would be fine. However, most of the trucks proceed south on Ellsworth to 9th and turn left. If they are in the right lane the need to switch lanes, at some times during the day would be nearly impossible for them and would just create another problem. The state has no corner on poor design of roadways. I don’t mind the dual turn lanes, but the timing of the lights needs to be changed back to that prior the North Albany Road construction.